1. What are the differences between Sidify Music Converter Free and Pro? 2. Is Sidify Music Converter Free currently available to all users? 3. Will I be Charged for Sidify Music Converter Free? 4. What kinds of music does Sidify support converting? What output format can it export? 5. Can I convert the entire playlist from Spotify? 6. How to submit feedback through Sidify program? The main difference is that you can use Sidify Music Converter Pro to your needs by directly download music from Spotify with the best output audio quality and keep all ID3 tags. Learn more different features available in Sidify Music Converter Free and Pro through: Free vs. Pro. Sidify Music Converter Free is currently only available to Windows users who own a Windows computer with access to the network or WIFI. This program is free to download for everyone and free to use for customers. Sidify Music Converter Free mainly convert Spotify music with Spotify URL from Spotify or other web URL link of Spotify music to MP3, AAC, WAV or FLAC format. Of course, you can. Sidify supports converting the entire playlist by coping & pasting the playlist link to Sidify pop-up window, or dragging & dropping the playlist from Spotify. 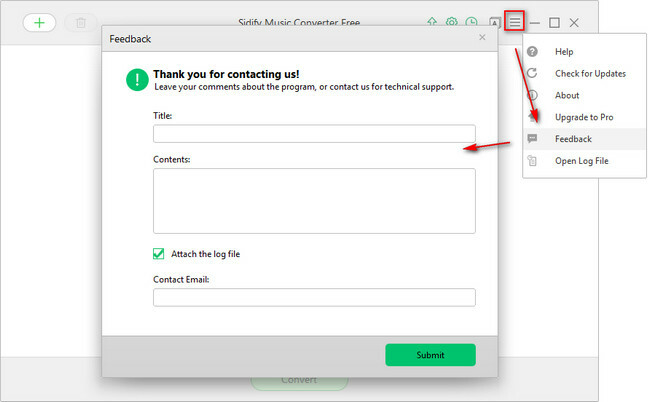 Now, users can submit their feedback through Sidify program by clicking Sidify menu button and choose "Feedback" in the drop-down list. Cause: Couldn't find the source of these songs on YouTube. Solution: Some music files may not be converted successfully. We suggest you can convert these music by using the Pro version of Sidify Music Converter. Cause: Network timeouts during searching and downloading. Solution: Please make more tries to re-add the music and convert for a try. Note: If above solutions still cannot fix your problems, please provide the following information to our support team via support@sidify.com. We will submit your feedback to our developer and inform you if the solution is available. Please send us the log file of Sidify. You can find it by going to the Sidify program, Menu > Open Log File. It is called log.txt.